Free Shipping of Sven Can See® products is for the contiguous United States only. International shipping and shipping to Hawaii or Alaska will incur shipping charges related to delivery. For use on: Prescription glasses, safety glasses, sunglasses, goggles, masks and face shields. You can use it on smart phones, tablets and cameras as well! Any lens type! Just Spray, Wipe n' Go! 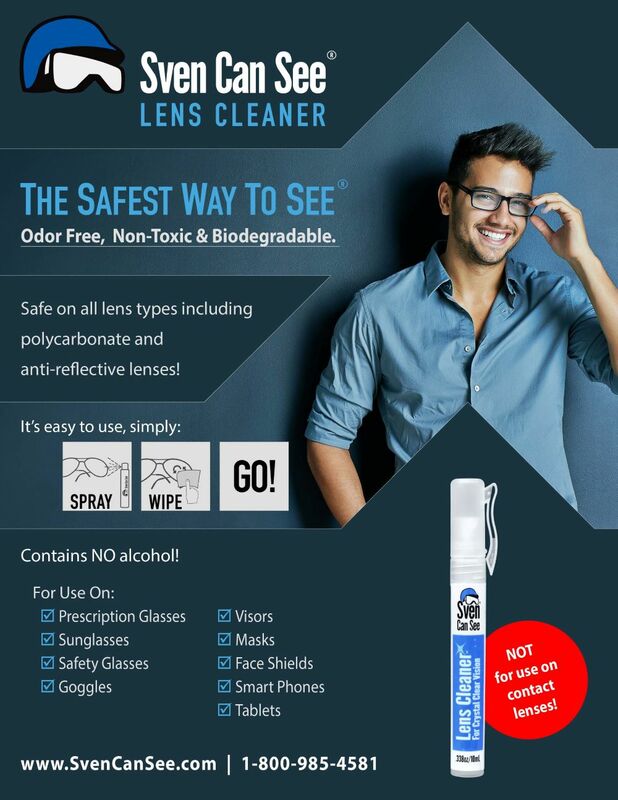 One order of Sven Can See® Lens Cleaner includes (one) 0.338oz / 10mL pen-like spray applicator and comes with a 100% money back guarantee. *We recommend using Lens Cleaner in conjunction with our other products! Lightly spray both sides of lenses. Wipe with a clean, dry, microfiber cloth. Enjoy crystal clear sight with The Safest Way to See! You have questions. We have answers! Here are some of our Frequently Asked Questions. If you don't see your question here, feel free to Contact Us! Q: What type of eyewear can this be used on? A: Sven Can See® is safe for use on all lens types, including Anti-Reflective Lens and Prescription Lenses. A: Sven Can See® has been tested to last a minimum of 8 hours. One application should last all day. Q: How many pairs of glasses can a bottle cover? A: The 0.27oz/8mL Sven Can See® Spray Bottle contains approximately 40 applications (i.e. each bottle covers approximately 40 pairs of glasses). Q: Can I use Sven Can See® on prescription lenses? A: Sven Can See® is designed to work on all lens types, including prescription lenses; however, if you are concerned about a possible reaction, please speak with your eyewear prescriber before use. Q: What temperature range does it work for? A: Sven Can See® was originally designed for cold weather use (ideal temperatures -20°F to 20°F/-28°C to -6°C). However, after further testing, Sven Can See® has been successful for normal and high heat temperature ranges as well. So, this product truly is for everyone. Q: Is the frost prevention effect instant? A: When used for the most extreme temperatures, like -20°F, Sven Can See® needs to be left on the lens for 5-10 minutes before exposure. Q: Is it better to apply the product indoors or outdoors? A: It is better to apply the product indoors in a clean, dry environment. Q: Is the product a liquid, a spray or a gel? A: : Sven Can See® Gel and Spray is a gel substance. The original bottle is a small squeeze bottle with a convenient flip-lid that can be used with gloves on. The spray gel comes in a pen-like applicator with a more liquid consistency. Q: Does the material have an odor? A: The product has little to no odor. Q: Do I need to clean the lenses first? A: It is always ideal to clean your eyewear before applying Sven Can See®. Make sure the lenses are completely dry before applying the product. A great lens cleaning product would be Sven Can See® Lens Cleaner! Q: Do you need to clean off the old product before reapplying new product to the lens? A: Ideally, yes. If you can clean and dry the lenses it is best to do so before applying a new layer of product. Q: Is it safe for my child to use? A: We recommend that this product be used for children over 6 years of age. A: Sven is a cold weather hiker. Read his story on our About The Company page! Q: Does the product expire? A: The product is best used within 2 years of purchase. Q: Can I use it on tinted glasses and goggles? A: Yes, Sven Can See can be used on non-prescription, tinted glasses or goggles. The tinted lens should not be scratched or peeling. Thank you but you have already commented on this review.